Proud to be a "Select Distributor"
Richards-Wilcox manufactures barn door hardware, door hardware, sliding door track and architectural components for doors of all types. Whether sliding doors for a barn, a custom door application in a business or doors on a private residence, Richards-Wilcox has the door hardware you need. Richards-Wilcox hardware has been producing products and serving customers since 1880. 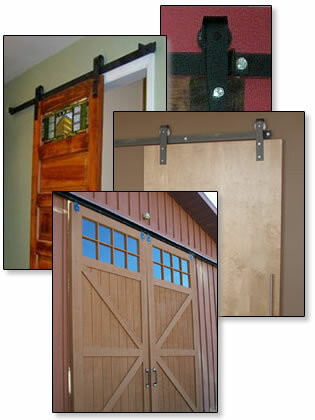 As the undisputed leader in heavy door hardware, Richards-Wilcox hardware develops products that last. Owned, operated and manufactured by Americans in America, you can expect solid products and old fashioned service with every sale. It will be done right the first time. For over 120 years, Richards-Wilcox has been a hardware leader. The inside track on handling heavy loads! Richard Wilcox hardware offers six different track types, ranging in weight capacity from 400 to 5,000 pounds! With over 120 years of experience in the hardware business, Richard Wilcox hardware has developed a track system to fit most any need. All of our products come with the Richard Wilcox hardware 10 year warranty. Click here to learn more about Richards Wilcox hardware. Richards-Wilcox, Inc. is committed to the long-term preservation of our environment. Give us the details on your door and we will match your door to the right hardware. Architectural Doors and Hardware, Inc. will help you design a hardware package perfect for your needs. Click here to contact us. As Select Distributors for Richards Wilcox Hardware and Leatherneck Hardware, Architectural Doors & Hardware offers a variety of overhead and bottom door track systems. ADH has track and hinges for nearly every door application from overhead sliding, bi-parting and even curved track for confined or limited space applications. Flat Track: 400# to 800# capacity with finishes available in painted, powdercoated, MP-109 (Bright Grind style), stainless steel, galvanized. Available in Standard and Decorative. Call for product selection assistance. With Richards-Wilcox sliding track hardware the possibilities are endless. 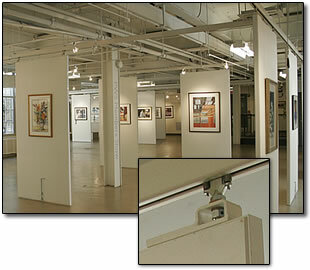 Art Galleries and Museums trust our products for both displays and storage systems. Movable panels in show rooms and boardrooms are a snap with Richards-Wilcox Hardware. Beauty and function is quarantined with our exclusive 10 year warranty. Contact us with any questions! Richards-Wilcox heavy door hinges are the tough guys of door hardware. Use them, abuse them, expose them to the elements, these bruisers won't let you down. Hinges built for strength, durability and smooth operation along with refined good looks. Ranging in size from 18" to 36" standard and up to 60" special order, we have the hinges to fit your door. 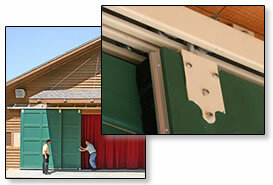 We use these hinges on barns, stables, zoo enclosures, wineries, gates, high security areas, etc. Heavy doors and gates love Richards-Wilcox Strap Hinges and our exclusive ten year warranty! For over 120 years Richards-Wilcox has been supplying a wide range of hardware for a variety of livestock facilities. We offer an assortment of colors, styles and finishes to match your facility. Our box track is ideal for barn doors, stable doors, equipment buildings and hay barns. Custom made doors are also available. Give us your specifications and we will be glad to price any door with a matched hardware set. Renovating a classic or building a classic? We have you covered. For an antique look and modern ease of movement, use the Richards-Wilcox Flat Track Hanger System. A proven system which has been continuously manufactured and improved upon since 1880, our Flat Track products offer style, durability and the quality you desire. Ask for information on our Renovation Hardware Line. Accessories that work for you such as: handles, pulls, latches, guide rollers, door binders, padlock staples, cane bolts, cremone bolts etc.Richards-Wilcox is a leading expert for over one hundred and twenty years. Everything comes with the Richards-Wilcox exclusive 10 year warranty! Are you renovating, restoring, or building a classic? If so take a look at the Richards-Wilcox collection of Restoration Hardware. When you have been around for more than 120 years, chances are you were the original then and now. The Restoration Hardware Collection brings the past to life with an ease of operation that can only be found in Richards-Wilcox products. Decorative strap hinges, door pulls, bolts, latches, trucks and flat track are available for slide, swing, and slide-fold doors weighing up to 5,000 pounds. We provide custom design services, and will partner with architects to recreate unique door hardware for various applications including national and local historical registered buildings. Since 1880, Richards-Wilcox has coexisted with some of nature's most interesting creatures. Zoo's, veterinarian clinics, research facilities, livestock producers, and horse farms depend on hardware that stands the test of time. We specialize in customized applications for remote operation, crowd gates, stalls paddocks, cages, transfer alleys, and heavy cremone bolts. Our heavy-duty track hardware can handle a 5,000 pound door and our locking mechanisms can withstand 4,000 pounds of thrust. Give us your bears, buffalo, elephants, and rhinos our hardware can hang with the big boys! Leatherneck Hardware, Inc./Coburn offers the ability to slide or fold many types of doors particularly in confined spaces. Applications for these types of systems include restaurants, store fronts, display areas and other locations where space is at a premium yet design and appearance are important. Coburn offers three specialty types of hardware. With Richards-Wilcox Slide-Fold hardware, we can maximize space in any opening. Available in regular and heavy-duty models with total load capacities up to 5,000 pounds. By utilizing our ball bearing trucks and hinges, smooth and easy operation is the standard. Your Slide-Fold system can be manual or power operated. 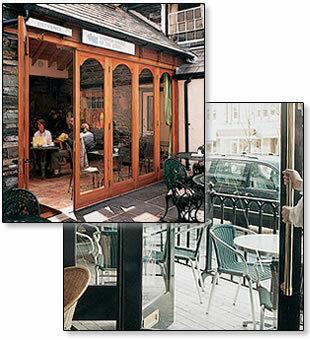 Slide-Fold doors are a great alternative to over-head doors or standard sliding door units. When space is limited or an original look is desired, Slide-Fold is the answer. Restoration, is a snap with a Richards-Wilcox Slide-Fold sets. 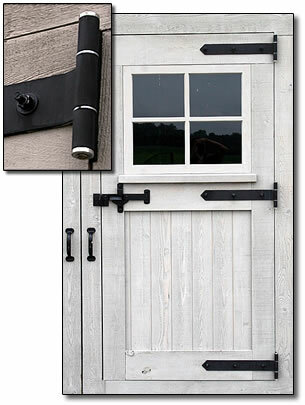 We can provide a classic look using our Restoration Hardware with flat track and strap hinges. Give us the size of your opening and we will design a complete hardware set to match. There is no need to struggle with old doors any longer, replace it with contacting Architectural Doors and Hardware today! Locking them up or keeping them out, criminals don't stand a chance. Architectural Doors and Hardware has teamed up with some of the best manufactures in the business such as: Corbin/Russwin, Detex, Folger Adam, Locknetics, Master Lock, Maverick Industries, Positive Lock, and Richards-Wilcox. Meeting the needs of our customers before and after the sale is our standard practice. Contact us when you need a quote or that hard to find item. "The show must go on" and that means hardware that works. Why does a company like J.R. Clancy trust Architectural Doors & Hardware? Because we leave the song and dance routine up to the actors; our job is to provide hardware that works. Automated or manual curtains, backdrop operation, side wing panels, light rigging, mobile acoustical panels, curved track systems, and frog switch assemblies. Find out how we can help you with your next stage rigging performance. Contact us! 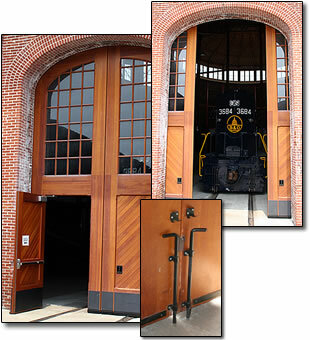 Architectural Doors and Hardware, Inc. is trusted by companies such as Harley Davidson, P.H. Glatfelter, Summit Health, Wellspan Health, Robert A. Kinsley Construction, Tyco Electronics, and Turner Construction to name a few. Trust is one of the most important aspects of business. That is why we are always proud to offer Richards-Wilcox products. Walk into an industrial plant and chances are you will find the Richards-Wilcox name, standing the test of time. When you use hardware in a factory, it better be tough. 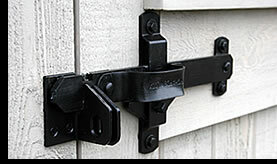 That is why products such as Tuff Track and our work horse 888 sliding hardware are so popular. From a light-weight welding curtain to a 5,000 pound door, Richards-Wilcox Hardware can do the job with ease. Does your door need to slide around the corner? Contact us, we have answers for limited space applications. Give us the specifics and our experienced team will design your complete hardware package. Food processing or corrosive environments often require stainless steel. No problem at Architectural Doors and Hardware, we have you covered. Complete sliding track systems, hinges, door frames and hardware are all available in stainless steel.